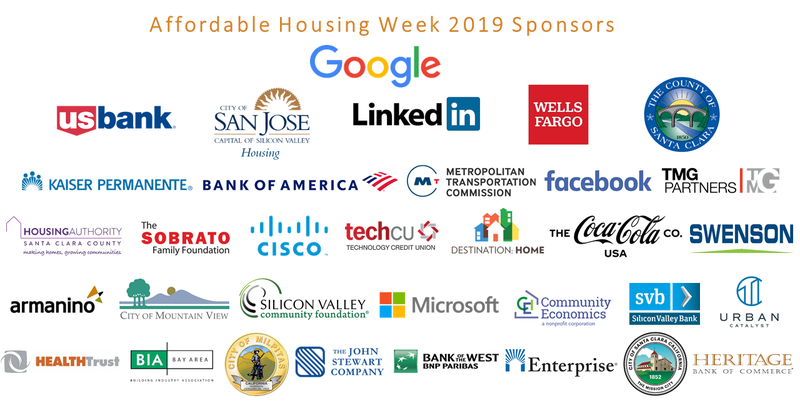 SV@Home is gearing up for another exciting Affordable Housing Week in Santa Clara County, this year with fifteen days of events and conversations from May 3-17, 2019! AHW brings our community together to learn, engage, and act on how we can work to make Silicon Valley a more affordable place to live for all of our residents. Affordable Housing Week will kick off with SV@Home’s annual policy luncheon on Friday, May 3rd, and end with a community mixer on Friday, May 17th. In between, we hope to see you at the Urban Land Institute Housing Conference, walking and biking tours, and many different events that will highlight not only our housing challenges, but also dig into the solutions we are building together. View a sneak peek of this year’s events below. Check back in coming weeks for a full calendar of 40+ events. Sponsor 2019 Affordable Housing Week! Sponsors are essential in making Affordable Housing Week and SV@Home’s robust events program a success. Please consider becoming a sponsor and supporting SV@Home and the affordable housing community for this two week-long effort designed to raise awareness, educate, engage, activate, and unite around affordable housing issues. It’s easy! You can pay by credit card here or by mailing a check to SV@Home at 350 West Julian St., Building 5, San Jose, CA 95110. View sponsorship levels and pledge form here, and contact Gabriela Chavez-Lopez at gabriela@siliconvalleyathome.org for any questions or requests for an invoice. By working together, we can address the Bay Area’s housing crisis and make Santa Clara County a more equitable place for all. Join us! With over 40 events, Affordable Housing Week is an opportunity to learn, act, and engage with everything Housing in Santa Clara County.